Early Access titles are a double edged sword. When used correctly, they can give developers a boost of funding in order to finish production of a title. They can also open a dialogue between developers and gamers regarding what gamers would like to see out of a game. When the blade swings the other way, however, Early Access titles can give players access to a game that is far from completion, or what might be considered a ‘playable state’. Words like alpha and beta and pre-alpha and B.E.T.A. get thrown around so freely that they’ve lost any real definition or meaning in the gaming world. All of this leads to a level of confusion that means that people buying an Early Access title have no idea what they’re getting into. I have a feeling that a lot of people have had similar issues when buying Valnir Rok. 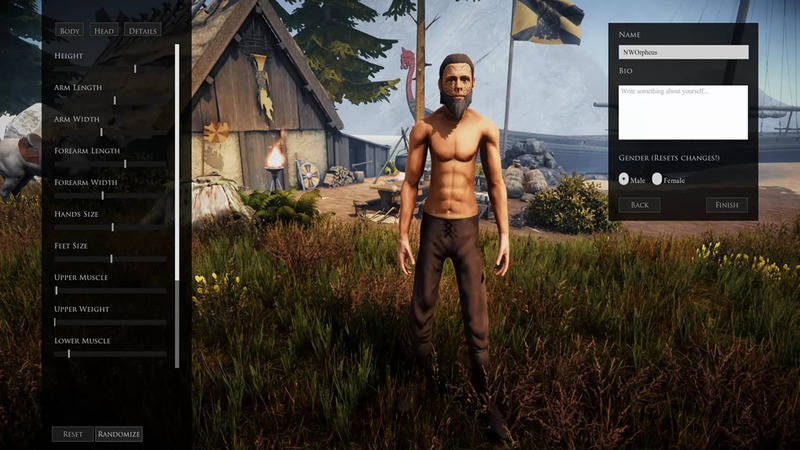 The Steam page for the title sells the image of a game that is about being a viking warrior, surviving by the strength of your blade, foraging for food and creating a meadhall. Of viking gods and frightful enemies. Yes, it tells you the game is in Early Access, but heck… 7 Days to Die has been in Early Access for 5 years now. Maybe this game is actually playable, regardless? The fact that the largest number of people you see on the servers at any given time of day is 15-20 immediately made me wary. That’s across all the servers, globally. 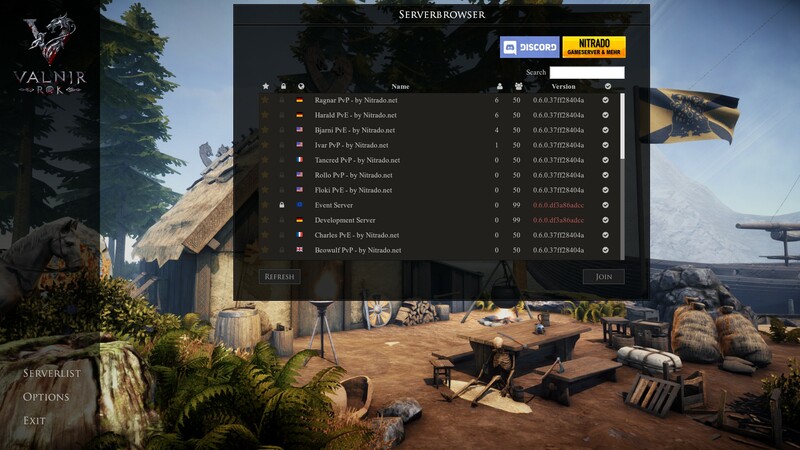 Any individual server might have as many as 6-7 people total during peak times (Servers are broken up into regions, such as NA, EU etc, and by PvE or PvP). That’s a pretty good indication that this game has a ways to go before it’s really playable, especially given the sheer number of people on the game’s official Discord channel. There’s a ton of people interested enough to join there and to perhaps buy the game, but very very few people actually playing it. This is a very sad fact, because the game has some really intriguing features, both implemented and planned, but in its current state? Well, yeah, no. 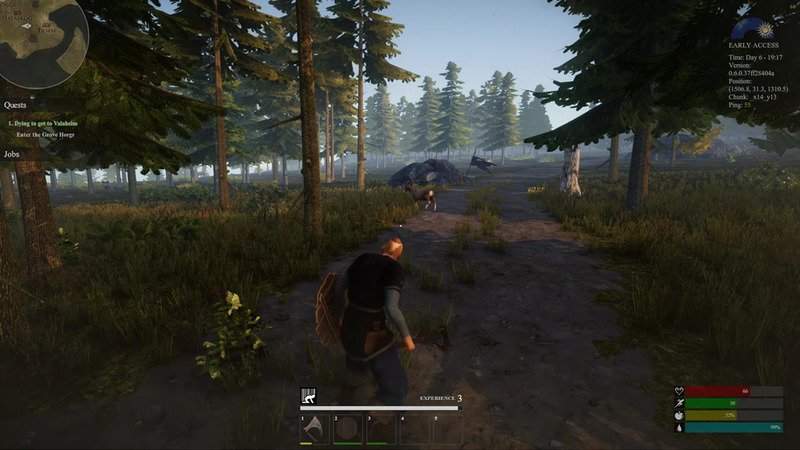 At its core, Valnir Rok is a survival game with a viking-ish theme. I say viking-ish because it does pretty good with an overall aesthetic of viking warriors (both male and female) running around with swords, axes, and round shields. You see crashed longships that look fairly authentic, and etc. What sort of put me off was the fact that the god system the game uses doesn’t have anything to do with actual viking lore. I did a little Google searching of the names of the gods, and really they appear to be original, which is okay and all, but a lot of the time if people hear anything about vikings, and have “The Gods” mentioned, they’re probably going to think of Thor and Loki and Odin and all that stuff. Again, I totally get why they moved away from it, but I also wanted to make sure people were abundantly aware that those aspects are not in, and if you’re looking for it, look elsewhere. 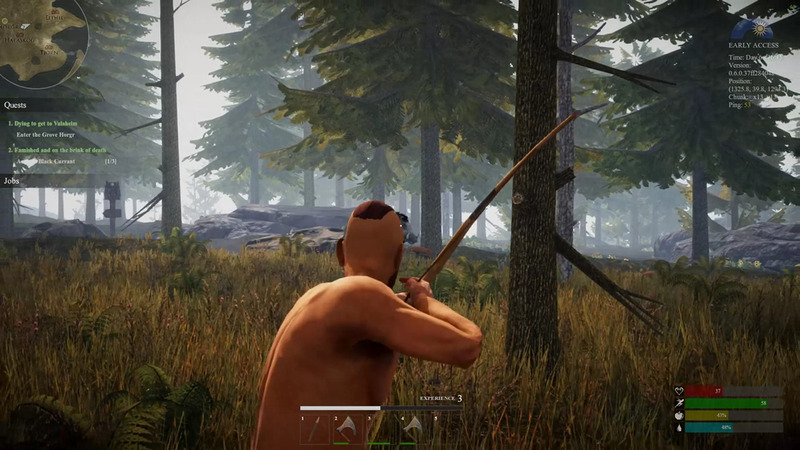 If you’ve played a survival game before, then you know that most of the game revolves around finding and eating food, carrying water, managing inventory, and building a sanctuary of some sort. All of these are true of Valnir Rok as well. You’ll swing tools at trees and rocks, pick flowers in fields, and build mighty structures to protect you from the elements and your enemies. Something that Valnir Rok includes that many other survival games lack, however, is quests. You find them as soon as you enter the game, and continue finding them in various places. This is cool, if you’re one of those types of people that need direction and help making your way around the world. There are definitely times that I can be that way. It seems that ignoring the quests and simply playing the game is also an option though if that’s what suits you, but in doing so you might not have as much ready access to deity influence. What deity influence does, I’m not sure. I couldn’t even really tell if it’s implemented yet. Also, some of the quests are bugged. 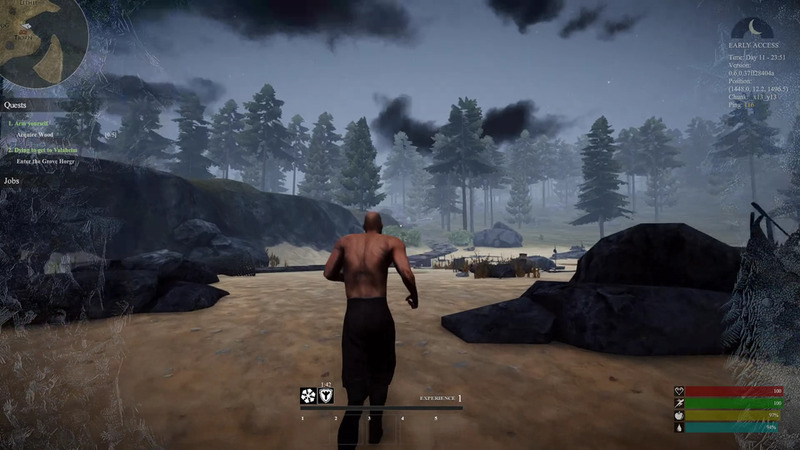 Being as it’s a game in alpha, it’s hard to know if this is bad design, bad development, something that is known but is going to get fixed, or some mixture of the three. The crafting system in Valnir Rok isn’t exactly what I would call unique, but it is enjoyable enough. You unlock recipes by placing an item in the craft window. Doing so shows all the things that can be crafted from your inventory using that item, as well as how many other items are needed. As far as I can tell, the most any given item needs is three ingredients. Some items, especially better quality tools, weapons, and armor, require that you be at a workbench in order to craft them. There are a LOT of recipes to try to figure out. Thankfully, someone made a nice little cheat sheet here that you can check out, if you’re so inclined. This is what harvesting looks like in Valnir Rok. Get used to seeing yourself do a lot of this. One thing I like about crafting is that if you’re making a large batch of something, such as arrows, you don’t necessarily need to keep your crafting window open while working on the full queue. This is especially good, since if you happen to have a weapon or tool equipped while working in the inventory window, you will attack with that weapon any time you click. Hopefully this is something that gets fixed before launch. One good thing we know about Valnir Rok, as of this time, is that it’s definitely not abandonware. Just recently, in fact, they put out a sizeable patch that included a complete combat overhaul, as well as some netcode fixes that they had hoped would fix all of their lag issues. This seems to have been a pipe dream, though, as I still hit quite a few latency spikes during my play. Back to the drawing board on that part! Guard, turn, parry, dodge, spin, ha, THRUST! As far as the combat part it… also still needs some work. The primary thing that was done with the recent patch was to create four classes of moves. There is the basic left click tap attack. This will cause your character to swing their weapon in a combination of swings that quickly depletes stamina, especially if you’re over-encumbered. In fact, my character was getting ‘winded’ after just one trio of swings. The next attack you do is by holding the right button. This power attack does heavy damage against a foe, but can be guarded against by using your shield. This maneuver is actually the third move, and is defensive. You hold your shield aloft, stopping attacks against you, but also stopping your stamina from regenerating. The fourth and final maneuver is meant, it seems, to counter the shield block, and is a shield bash. Doing this will knock your opponent’s shield out of the way, leaving them vulnerable to attacks from your weapon. I’m not sure what the fighting was like before the update, but I wasn’t all that impressed with it after. The hitboxes seem really horrible, especially when using ranged weapons (but melee combat was not exempted from this). It’s hard to tell if this is an actual design issue, or just a server latency issue. I do know that ranged combat is in an abysmal state. Not only can you shoot yourself with an arrow if you fire while running forward, or falling, but arrows seem to need a lot of adjustment in regards to damage. It takes 2 arrows to kill a rabbit, or even a domestic chicken. Goats seem to take 5-6 arrows, and larger game, such as boars, seem to soak ammunition like coeds soak beads at Mardi Gras. This puts you into an exhaustive cycle of collect stone and wood, craft arrows, and hunt animals for food, then repeat. At least crafting does grant you experience, and allows you to gain levels. The axe doesn’t actually do that much damage. Health bars are just one of the many many.. Many…. MANY… bugs. And level gaining is fairly important and useful. Doing so grants you ability points which can be spent in a variety of trees. There are six profession trees, such as blacksmith, carpenter, and hunter, as well as 3 trees devoted to the gods. I’m not sure if there’s any maximum level, but it seems that crafting is the way to ‘cheese’ your level. In fact, on one post on Steam (I lost it, so I don’t have the source, sorry!) 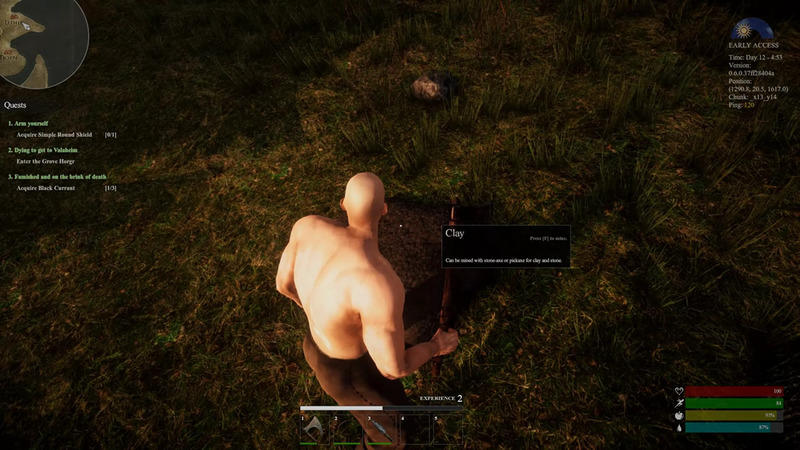 I saw a developer recommend to a player that chopping wood, crafting wood sticks and then sharpened wood sticks, ad nauseum, was the best way to gain levels. To me, this just seems like endless grinding for the sake of grinding. You can’t even use the sticks for firewood after it’s been sharpened, so it’s a complete waste of time, in practical sense. You gain only xp for doing it. If such a maneuver is needed to advance, it seems like maybe some things should be balanced a bit better. I really wish I could give Valnir Rok a better score, but at this point in time it gets 2 out of 5 stars. I was going to give it a 2.5, but that was before I discovered the bugged newbie quest. I feel like the new player experience is just really important to players, and that if I find a bugged quest within the first ten minutes of gameplay, the first thing I’m likely to do is quit and ask for a refund. This is at one of the newbie starting locations. Finding bugs in the first 30 seconds of gameplay doesn’t make me enthusiastic. I said earlier that Early Access was a double edged sword. The same thing goes for pre-orders. I think in some cases, both of those things have been beneficial to the game industry, but I am beginning to think that time has passed. I for one am simply not pre-ordering games at all anymore, especially after Bethesda and their unmitigated disaster that was the Fallout 76 launch (the launch itself, I stand by the game). I also really think that games need to move away from Early Access models and rely more on Kickstarters. If you release games that are in the state that Valnir Rok is in, it’s going to drive your players away before you can even establish a playerbase, and this is going to do you a lot more harm than good in the long run. This is especially true in genres in which the market is saturated, such as survival titles. With so many other options out there that aren’t bug riddled messes, and are in a much more playable state, releasing too soon to the playerbase is like falling on your sword before you can even swing it.